Boxing Day 2010 (26 December 2010): I was on the phone to my family for Christmas when the ground lurched and everything in the house rattled. My poor father (on the other end of the line) heard every swear word he knew and probably a few he didn’t as the Boxing Day quake scared the daylights out of me. Our white Christmas tree in our back lounge was swaying back and forth, the ornaments bouncing rapidly as the quake continued. It was a 4.9 quake, striking in the city itself, only a few kilometres below the surface. The trembling continued in various intensities for about 30 minutes. The city was closed again, cordoned off, as the damage was determined. I remember driving through once the city was reopened a few days later, and there were buildings fenced off all over the place, the damage apparent. I said to one of my friends that it reminded me of living in post-World War 2 Europe. Fast forward to Christmas 2011: We’d had a horrible year. 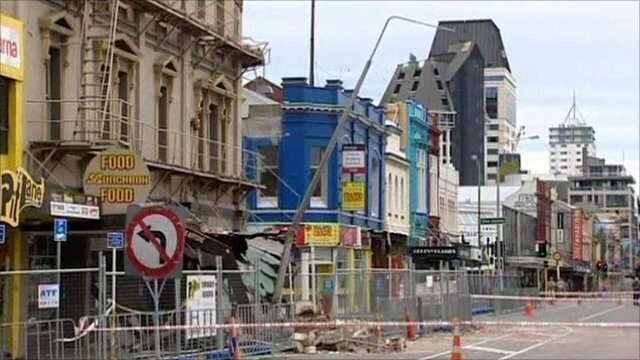 The 22 February 2011 quakes changed the landscape of our city forever, destroying or irreparably damaging many homes and buildings, killing 185 people in the process. The city centre was cordoned off, this time for years. Mother Nature decided to strike again, this time on 13 June 2011, destroying more homes and buildings, heavily damaging our work building. Our team spent 2011 moving premises several times, trying to rescue equipment and files and computers, finding new premises, and rebuilding. After a while, the aftershocks subsided, and we started growing accustomed to our post-quakes lives. Noel and I debated about putting the Christmas decorations up. We didn’t feel very Christmas-y and we were both exhausted after the year we had. He came into the room to find me putting the tree up and said something or the other to me; I snapped back that damn it, we were going to have something normal this year, and it was going to be Christmas. 23 December 2011: Noel, Don, and Soni were at our new premises, putting the final touches here and there to be ready for a January 2012 opening. We’d spent $500,000 dollars (a little under half from insurance, the rest borrowed) to get the new premises up-to-scratch. I was at home, in my pyjamas, waiting for Noel’s presents to arrive from Amazon.com; it’d just be my luck that I’d quickly jump in the shower, and the courier would try to deliver it, only to find out I couldn’t get the package until after Christmas. I was walking along the breakfast bar when a very large jolt shook the house. Things started to fall over, so I chucked a stool away from the breakfast bar, grabbed Jenah (who was frightened out of her poor mind), and dove under the breakfast bar, Jenah leaning into me, me holding her as tightly to me as I could. The Christmas houses and people on the tabletop across from us started to fall over and shift, ornaments were falling off the tree, and the sounds of things falling and breaking filled the house. It was a 5.8 quake, in the ocean only about 10 kilometres or so from our house. Running outside in my pyjamas, I met the JAndersons’ cleaner Viv on our driveway. She was upset, I was upset, and then a 5.3 aftershock hit. The curtains were swaying in the window, Viv and I were holding on to each other, the trees on the section were swaying back and forth; it was so strong I had to pull away from Viv, grab her arm, and steady myself by holding the trunk on my bouncing car in the driveway. Other neighbours arrived out after that one, and we all were talking. I kept trying to get a hold of Noel on my phone, but the lines were down. I also tried Don and couldn’t get a hold of him. I finally got through to Noel, who had been driving at the time and was heading home. Amazingly, somewhere in the middle of this all, my Amazon package arrived. Noel arrived home, as did James and Jacqui and the kids. Noel urged me to take a shower, which I did, and James came over for a much-needed drink. I had to call my Mom to let her know we were okay (living overseas, you don’t know how much or how little news they get of the large aftershocks, and if they do get the news, you don’t know how blown out of proportion it can be). On the phone to Mom, standing in the front living room, I felt another jolt. James, in the next room, starts saying it’s a big one, and I’m talking my Mom through the quake as the big jolting motions hit. I crouch in the doorway, holding on to the doorframe with my free hand as Mom’s saying, “What is that? What’s that noise?” and I keep saying, “It’s a big quake, Mom. It’ll be over in a few seconds. Wow, it’s a big quake.” The overwhelming rumbling noise, coupled with the grandfather clock’s counterweights dropping and crashing through the bottom of the clock and the top of the clock coming apart and dropping parts on the floor, scared the daylights out of her. Once the shaking stopped, I told her I had to go, and Noel, James, and I (along with everyone else in the neighbourhood) came dashing out of their houses into the relative safety of the street. It’d been a 6.0 quake, just a little ways away from the 5.8 that had struck over an hour earlier. 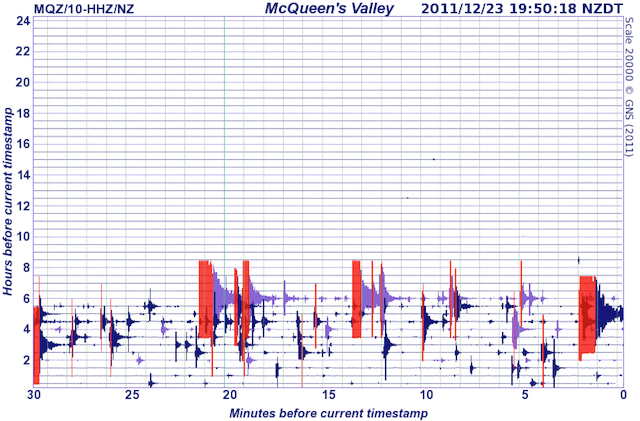 The McQueen’s Valley seismograph showing the relative inactivity on 23 December 2011 and then the earth springing to life again through earthquakes. The New Zealand National Seismograph Network on 23 December 2011, recording the major quakes that hit that day. The last two Christmases have been overshadowed by seismic events, and maybe this is the new normal we have to live with now. I’m hoping that the relative seismic inactivity (knock on wood) will continue now for a very long time.